- Dude, if you have to ask, you shouldn’t be here. - I’m sorry for your excess, but please be careful washing your Bear Arms Shirt in the washing machine. You especially don’t want to put it in the dryer! This will destroy the awesomeness that is your Bear Arms Shirt. Try to Dry Clean ONLY, but if necessary, you can wash your Bear Arms Shirt on gentle cycle, but you need to HANG DRY it just like your forefathers used to. - Ha! You’re cute…. but no. 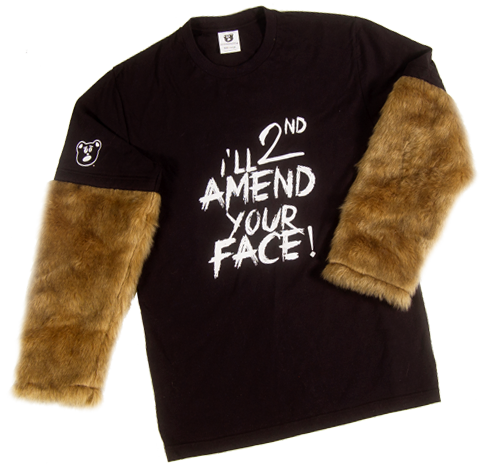 The Bear Arms Shirt is made of something called “faux” fur. This is imitation fur to resemble the awesomeness of real bear fur. - Why yes there is. Visit http://beararmsshirt.com/size_chart.html for all the details. If you still need help finding the perfect size, please email us at awesome@beararmsshirt.com with your height & weight and we can pair you up with the bestest size possible. - Why yes you can. There is a setup charge and a minimum order of 24 shirts. Please email us directly at awesome@beararmsshirt.com for details and pricing. Keep in mind, we won’t print anything defamatory or graphic. Keep it classy folks. update on where the Pony Express (USPS) is with your order.